From Songs to Sonker, advice on Southern livin' and lovin'from the South's number 1 expert! Christmas Time's a comin' y'all. . . . Time to make Christmas! Remember the most important thing about this season is the love in your heart. Have fun while you're making Christmas. . . . Use your imagination and a little ribbon. If you have ribbon, you have Christmas! My family and friends know that most of my shopping, Christmas and otherwise, is done at the thrift store or garage/estate sales. Add in the Everything's A Dollar Store and is this a great country or what? Today on WIBW, I showed Chris Fisher a cake plate that Woodrow found at a garage sale. . . . It's a beautiful, wintertime cake plate but you can't just give someboday an empty cake plate. So we made a cake. Now the cake I made for this was an expensive, time-consuming cake so only give this to someone special. I made a sugar-free version and with all the folks that have issues with sugar it is a nice thing to have at least one sugar-free dessert on hand. I adapted a peppermint, white chocolate cheesecake recipe I found. It turned out very rich!!! Here, WIBW's Chris Fisher is frosting the cake. We missed Amanda but talked about food and presents and, of course, music. Preheat oven to 325. Line 2 cake pans with tinfoil and spray lightly with Pam. Leave enough tinfoil on the sides to lift out of the pan. Cream the ingredients and pour into foil-lined pans, and plac them on a baking sheet in water. Bake for 25 or 30 minutes (mine took at least 30). Allow to cool, then freeze thortoughy. For cake layers, I took a Pillsbury Sugar Free Yellow cake mix and another package of sour cream, 2 eggs, 1/3 cup vegetable oil, a couple of drops of peppermint oil and mix ingredients. Bake in two cake pans at 350 for 15 or 20 minutes. You know what, since this is a yellow cake mix and we don't really want yellow cake for Christmas, I alo dropped a couple of drops, or maybe half a bottle, of red food coloring--enough to make the batter pink. Now, for the frosting, I made White Chocolate Instant Sugar Free pudding and mixed it with Sugar Free Cool Whip.You might want to make it with a little less milk, or a little less Cool Whip. Sprinkle some crushed-up peppermints on top. This is very good, per Chris Fisher! I have Lila Belle taking down the Christmas tree while I minister to the needy--those in need of love advice. Now in all honesty, before I found Woodrow, I didn't know squat about love. But the Good Lord has blessed me with a fine man and a wealth of knowledge, and He has led me to share it with you. One of my male friends who has been looking for love for some time, finally informed me that he is following Woodrow's advice and it is working out quite well. He told me he decided he wasn't going to drive all over hell to find a woman, if God wanted him to have a woman he's going to have to put her down right here, my friend was told by Woodrow. And God put a big old red wig on her so he would be sure to see her. Yes, the Good Lord in His Infinite Wisdom sent Woodrow a pushy woman with big red hair. I am sure that someday you will be equally blessed, my friend! We have a tradition in the mountains called "Breaking Up Christmas". The parties start on Christmas night and extend to January 6, referred to as Epiphany by some, but called "Old Christmas" by my Granny. In this hectic world where it is so hard to cram in all the activities before Christmas, I think it is the perfect time to revive this tradition. It is a gentler transition into the New Year, and it is a reminder of how important friends and family are; everything else is secondary. This Christmas was so special to me and to Woodrow because we were able to go home to the hills and visit with family and friends he has never met. They loved him, of course. Especially my uncle who brought a banjo and a guitar to the family dinner and commented, "Ah heard you could pick some." In all the commotion, one of my cousins commented on how I used to be introverted. Now, introversion is a relative term (as the pink boa illustrates), but it was true. I struggled so with being myself. If there is one reason life with Woodrow is so right, it's because I am truer to myself than in the past, and so is he, I believe. You know, it's been pounded over your head with a rolling pin, but BE YOURSELF!!!!! TOTALLY YOURSELF!!!! Then, and ONLY then, will the Woodrow or the Dixie you find be truly connected. So why on earth are we all so afraid of being ourselves? I don't know. If you figure that one out, let me and Dr. Phil know. There is a struggle between acknowledging your uniqueness and yet how similar we are is the conflict of the ages. After failing miserably at love, or something like it, I thought that having things in common was very important. It is. But what should you have in common? Not necessarily interests or hobbies. That's nice, but not the glue that binds you. What you must have in common are VALUES! Now, this means you need to know what you VALUE. When I look around at friends who are foundering miserably and going from one encounter to another like Aunt Hazel scarfing the Chex Mix, this is the most common flaw I see. How can they enter wisely and lovingly into a relationship when they don't even know what theythemselves hold dear? Faith? Family? What does that mean? Home? What kind of home? What kind of life? Think about these things as you are breaking up Christmas. Think of who you are, who you bring into this New Year and what kind of people you want to surround yourself with. Be patient, with others, but most importantly with yourself. Love yourself. Love your life. Be grateful. If you love the Andy Griffith Show (and something is seriously wrong with you if you don’t), you’re going to have a spasm when you visit Mayberry on Main -- as in Main Street, Mount Airy, North Carolina. Yes, Dear Hearts, I’ve been home for the holidays! So Darrel and Debbie loaded up their truck and headed to Mayber-ry. They love it, and Mayberry loves them. In between Cousin Brenda’s creamed potatoes, Cousin Dennis’s red velvet cake, Aunt Emma Lee’s chocolate black walnut cake, Sister Berniece Denise’s sweet potato pie, Cousin Christine’s meatballs, Aunt Lucille’s cornbread muffins, Sherry Boyd’s biscotti (the best I have ever had!!!) --- in between stuffing Woodrow and myself until we were ready for the Santa Claus tryouts, we waddled into Mayberry on Main. Even though they didn’t grow up in the South, Darrel and Debbie sure have been blessed with Southern hospitality!! They love my hometown with the zeal only a convert can possess, the same way I love my adopted Kansas and sing its praises. I was so pleased to see them again. Since they have the license to produce the Mayberry memorabilia that EVERYBODY has to take home to Michigan or Maine, Alabama or Alaska, the store is neatly stacked floor to ceiling with t-shirts, cookbooks, mugs, magnets, and local edible goodies. Darrel is an connoisseur of fine hot sauces and the wall is lined with empty bottles that are evidence of years of research. 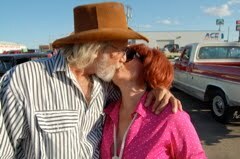 In short, Darrel and Debbie love sharing what they love. They’re my kind of people. And remember, love makes life worthwhile. Love what you do and love the people you’re blessed to share your life with! And a Merry Mayberry Christmas!!!! Play "Rockin' Around the Christmas Tree." Wear something swingy. With sugar falling on us faster than snow, and piling up more dangerously around our hips, here is a wonderful sugar-free recipe that will satisfy your cravings and for those who aren't interested in sugar-free, they will never know the difference. 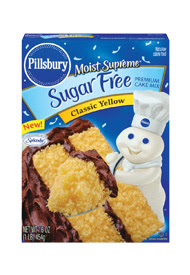 Take 1 box of the Pillsbury Sugar Free Yellow Cake Mix. Add the oil (or you can use about a cup of no sugar added apple sauce if you want to cut down on fat). 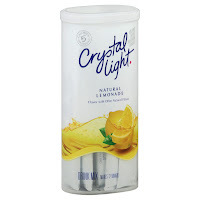 Mix up a 2 quart packet of Crystal Light Lemonade mix and use the lemonade instead of water in the batter. I do not use eggs, because I like this really moist. If you want to use an egg, just use one. Egg makes it cakier, but it also makes it a little drier. You might want to add a couple of drops of lemon flavoring, but you might want to keep the cake a little more neutral. Then put the batter in cupcake tins and bake according to the package, sorta. When you change ingredients, especially the egg and oil, it has an impact on cooking time. It may take longer. Keep an eye on and test with a toothpick. While they are baking, get a container of the Vanilla Sugar Free Pillsbury Frosting. Dump into a mixing bowl. (You might even want to warm it for a few seconds in the microwave to make it mix more easily.) Dump DRY lemonade mix, 1 two-quart pack or into the frosting. Add lemon flavoring to taste. I like to add a little lemon zest, just to make it real. You might also want to add some yellow food coloring because none of this has a lot of color. It will be very pale yellow without added coloring. I also add half a stick of softened butter, for flavor and for texture. The packaged frosting can be sort of "plastic" tasting, especially sugar-free, so I think mixing it with cream cheese, a little sour cream, or some butter, really does help the flavor. Experiment with what tastes good to you. When your cupcakes are done, let them cool for at least 20 minutes before adding the icing, and then pile it on. It's delicious. You may want to decorate with some sugar free candies. You can crush some hard lemon candy and sprinkle on, or just find some cute candy and stick it in the middle. Arrange on a platter with Christmas ornaments. If you're serving this at a party, you might want to put a little card that says this is sugar-free. This is not LOW calorie, but if you are trying to keep an eye on sugar without giving up treats, this is wonderful. 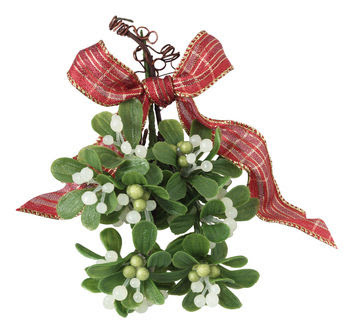 Now, go get you some REAL sugar under the mistletoe! Many of you are agonizing over what to give for Christmas. I am here for you, Honey! 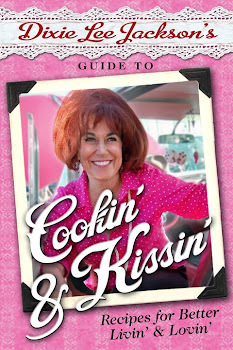 My Guide to Cookin' and Kissin' fits every stocking and every pocket book, and Lord knows, there's a need for it! Click on the link to the left to order with Paypal or send me an email for other arrangements. It is also available on Kindle, so I sure would love it if somebody would drop me one of those in my stocking. So Woodrow and I are in Philadelphia where there are a lot of Yankees. Only a couple of days ago we were in Mayberry (and Lowgap and Lambsburg), where he met some of my family for the first time. I thought it best to give him a break before heaping the whole group on him later this week. My sister, Bernise Denise, will be having as much of the family as can fit into her house on Friday night. You know what that means? Yes, someone is already cookin' up a mess of green beans! We stopped by my Aunt Gladys's house and there was leftover cornbread on the counter. I had me a piece with just a little dab of butter . . . .oh my! I'm sorry, but you just don't walk into one of my friends' homes in Kansas and find REAL cornbread. . . . Of course if you did, I would be so big my hair wouldn't fit. The only pursuit equal to the sharing of good food is the sharing of good music. You all know I love me some good picking, so I am thrilled to be the emcee for the Americana Christmas Show this Saturday night at the Potwin Presbyterian Church. Show starts at 7:30. The church is located at 5th and Washburn here in Topeka, and has some of the loveliest stained glass windows you have ever seen. My banjo-picking preacher friend Sue Ann Seel is the pastor, so this is a church with some real soul. Performers include: Ashley Davis, Celtic,; Racheal Black, Blues; Mojo National, Gypsy Jazz; Diane Gillenwater, Bluegrass; Jim Krause, Oldtime; and many more professional artists playing your favorite American Christmas music. Americana Teachers and students will also perform. This is a fundraiser for the Americana Student Scholarship Fund. The Americana Music Academy is a non-profit music school with locations in Topeka and Lawrence. 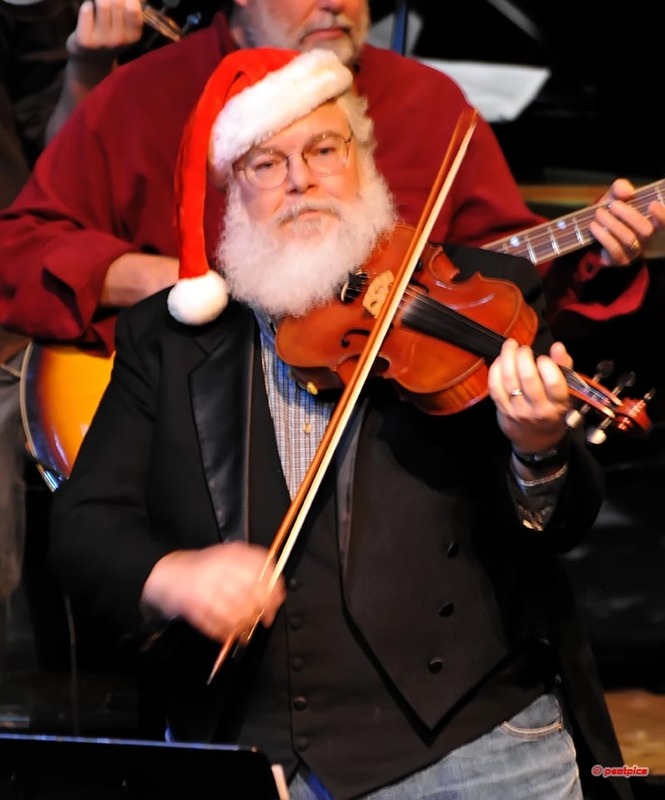 There will also be an audience sing along with fiddle caroling and the renowned repeat of the Hallelujah Chorus played on Kazoos. For more information call my dear friend, Diane Gillenwater, at 785-249-8830. On the same evening, Woodrow will be playing with Borderline at the Moose Club on North Kansas Avenue. Let me tell you, there are some dancers there! And do they ever decorate for the season! Friday night, of course, is First Friday so Woodrow and I will be at the Art Walk, first at the Jayhawk Theater at 7th and Jackson, and then at Rusty Haggles in the NOTO Arts District. December is going to be a fun month!!!! Dixie Lee Will Be At. . . .
October 2 -- Apple Festival, Ward Meade Park at Old Prairie Town. I'll be your emcee for this annual event. 10 to 5. Entertainment includes my buds Greg Fox and the High Falutin' String Band. Tickets are $5 in advance; $6 at the door. See you then!!! April 1 -- First Friday Artwalk, opening of the Eclective, 900 North Kansas Avenue in the historic NOTO district of town. This will be the biggest party in town so join me and plan to pick up an autographed copy of Dixie Lee Jackson's Guide to Cookin' and Kissin'. April 15 -- The Shepherd Center, Topeka, presentation and books for sale.